Beijing wants to tackle traffic congestion. It should probably start by slowing the increase in ‘official’ vehicles. Late last month, the Beijing city government announced measures to counter traffic congestion, including limiting new vehicle registration numbers to 200,000 and targeting the rising number of supposedly ‘official’ vehicles. Asked about the exact number of official vehicles, however, authorities have said they aren’t able to provide such ‘sensitive’ information.The question of why this information is so ‘sensitive’ has become a hot topic of debate online. 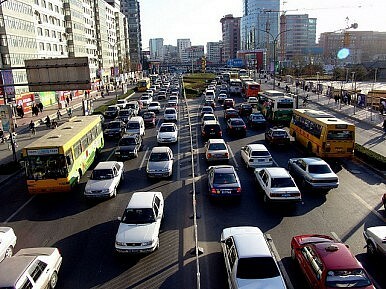 According to a report by CCTV in November, there were about 700,000 in Beijing—almost 15 percent of all cars in Beijing. The authorities refused to confirm the figure, stoking public discontent on the issue, especially as these cars are paid for with taxpayers’ money. Congestion in the capital has become the norm, especially in rush hour. I can speak from experience—the other day it took me almost 2 hours to do a less than 10-kilometre drive home from work. Beijing’s local government has in the past put a lot of effort into solving congestion, including offering amongst the cheapest bus tickets in China and a flat charge for all subway trips in the hope that residents will choose public transportation over cars. Meanwhile, six circular roads have been built around Beijing, while old roads have been widened. Yet all this is unlikely to stop the public complaining about official vehicles. Even if authorities promise a zero increase in such cars, people want transparency on these issues, otherwise how can they monitor progress in reaching targets? If Beijing doesn’t announce substantive measures for constraining official vehicle numbers soon, the city will probably never rid itself of this horrific congestion. That said, perhaps moving the capital somewhere else is going to be the only way officials will be able to tackle traffic congestion here.